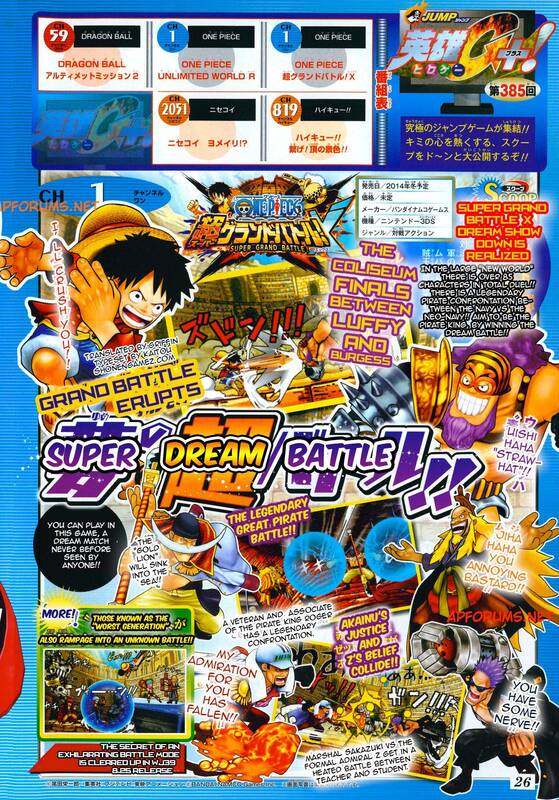 The latest Weekly Shonen Jump scan for showcases Akainu, Z, Shiki, Whitebeard and Burgess as playable characters for One Piece: Super Grand Battle! X, the latest installment in the series for the Nintendo 3DS. In the scan, you can see “The Legendary Pirate Battle” between Whitebeard and Shiki, you can also see the battle between Akainu and Z. Credit to ArlongPark for the scan. Thanks Griffin for the translation. Awesome Z is playable, looking forward for more Charakters. If Burgess is there, Sabo must show up as a support char or at least in the background, Zephyr and his smash buster are for the first time in an OP game and I’m loving it, the supernovas are all in their TS version (except Bonney), maybe everyone playable this time? Since this game is more “Gigant Battle 3”, and god knows how much I loved this game, I truly want 2 attack buttons cause the Gigant series hadn’t it, even if this game is a 4p chaotic (and hopefully balanced) brawler. Imagine Sabo being playable and having….’that’ as well. I hope Bartolomeo is playable!!! Also Rebecca. I’m glad they put the worst generation in. I really want a 3ds now!! !